Never used in the Netherlands due to the different depth of matrices. 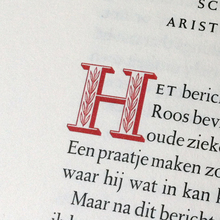 Digitally revived by David Esser as graduation project at Type and Media in 2003 (unreleased) [Dutch Type] and, commercially by David Berlow in 2009. Latter is available both from Font Bureau and Linotype, in Roman and Italic, each with small caps.